KEEP THE KIDS QUIETER FOR LONGER: With the built-in high-capacity 2,500mAh rechargeable lithium battery, you can keep your kids entertained for up to 4 hours, meaning more peace for you. It can even be powered by your car charger or AC adapter, ensuring you can use it for longer anytime, anywhere. SUPPORTS HUGE ARRAY OF MULTIMEDIA: Supports direct play of CD, DVD, CD-R/RW, DVD -R/+R, DVD+RW/-RW, VCD, SVCD. Supports USB and SD Cards for playing MP3/WMA/WAV, JPEG, MPEG2/AVI/DIVX. Leave the power wires at home. With this improved battery, we extend the play time to 4 hours. So now you can keep the kids entertained for longer and won't have to worry about losing battery power suddenly. Thanks to a built-in USB port and SD card reader, the kids can enjoy digital movies and MP3 files directly from a USB flash drive or SD card. The built-in rechargeable battery will run the DVD player for 4 hours on a full charge for a portable movie watching experience anytime, anywhere. Even when traveling on a gravel road, the shock resistance function will allow the kids uninterrupted viewing. What a great little DVD player we go camping often and sometimes get caught in the rain, well the kids don't want to watch what Mom and Dad are watching I can grab one of these out the truck and presto there happy in a bunk bed watching a movie of their choice, gives me the peace i was looking for when i can't set by the camp fire. Exactly what I wanted....good quality and fast shipping. This DVD player is great for our little guy! We got it for vacation and he has really enjoyed it. The remote is handy when you are just guessing and hitting play until you hear the movie start. The volume control is on the DVD player . Great purchase overall. They arrived in just a few days, seem to work great, kids have no problem operating them. 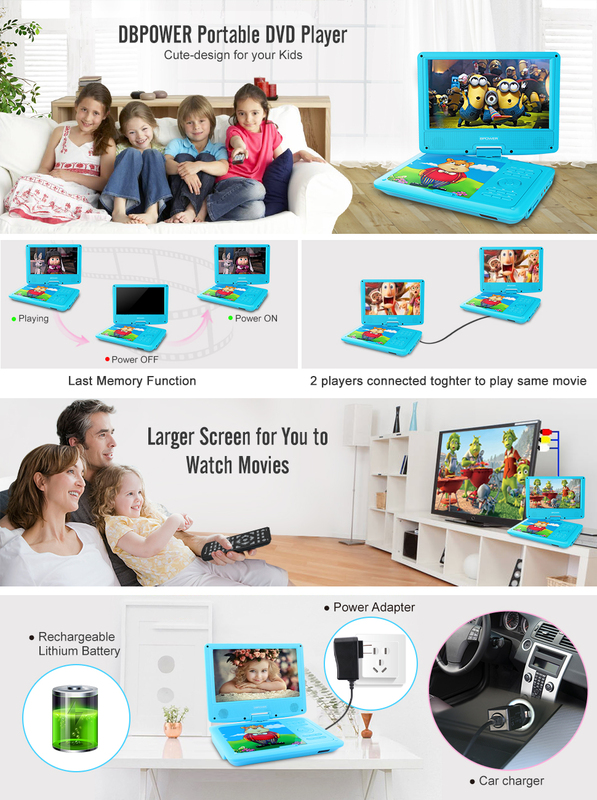 Click the button below to add the 9" Portable DVD Player for Kids with Rechargeable Battery, SD Card Slot and USB Port to your wish list.